The Buckeye Valley Museum, established in 1954, is housed in a building whose facade was designed to resemble the front of the old Kell mercantile. The historical society’s mission is to preserve and share the history of Buckeye, Arizona and its surrounding communities with emphasis on farming. Its collections include historic photographs, family histories, Hohokam pottery and artifacts from the early establishment of the Town of Buckeye and Buckeye High School yearbooks dating back to 1928. The prehistoric Hohokam people lived and farmed in the Buckeye Valley more than one thousand years ago. They grew cotton, beans, corn and squash in irrigated fields near their villages along the Gila River. Cactus fruit and mesquite beans along with rabbits and deer were an important part of their diet. Visitors to the museum will see an impressive collection of Hohokam clay pottery, stone and shell jewelry, arrows, axes and other stone tools. They used stone manos (grinding stones) and metates (rock slabs) to grind corn and mesquite pods to make flour. 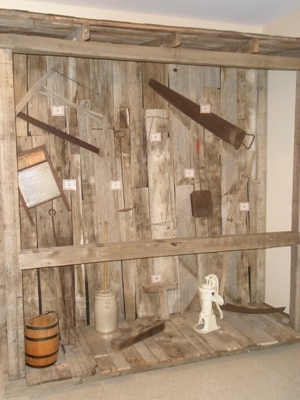 Early settlers in the Buckeye Valley who made the community’s history were farmers and their families who grew crops, built houses and made their own tools. When a group of settlers left Ohio and arrived in the area in 1888, it was the start of what is now the town of Buckeye. Malie Monroe Jackson built a canal to help haul water to his crops and named the canal Buckeye, in honor of the state of Ohio. At first the town was called Sydney. Later when the town wanted to incorporate as Buckeye, the residents had to get a court order from the Arizona State Supreme court allowing them to do so. In 1885, a group of investors from Ohio led by Malie Monroe Jackson, an Ohioan, built a canal in the desert west of Phoenix. A year later when the canal was in operation Thomas Clanton, a homesteader near the canal, applied to the United States Postal Service for a post office. The Postal Service granted the request and named the new home post office Buckeye. The museum maintains biographies and photos of the Buckeye Valley and West Gila Valley Old Settlers Union, which was founded in 1934. More than16,000 names have been entered into the museum’s family history program. The museum has an extensive oral history program which documents the residents’ life experiences. After the Hohokam left the Buckeye Valley about seven hundred years ago, the land remained unoccupied until the 1880s. Several small ranches were developed first in Liberty and then in Palo Verde. The construction of the Buckeye Canal in 1885 opened up large tracts of land for farming. The first crops were alfalfa and grain used to feed livestock. Later cotton became the primary crop. The Buckeye Valley Museum is a part of the Heritage Park project. This 13.9 acre park, was formerly known as the Eastman Gin. An on-site cotton gin will be restored and used for educational and entertaining demonstrations. In addition to the museum, Heritage Park will feature a couple of acres of native agricultural fields; an antique tractor and farm implement displays; a farmers market; a large scale park; an outdoor amphitheater and a walking trail.